assistance in choosing the right air bearing for your particular job. For a smooth, trouble-free operation of your air bearing kit, or system, the floor surface should be level, smooth and non-porous – preferably concrete. The best floor surface will have no cracks, holes or indentations. Minor cracks and small holes can be easily filled with an epoxy resin type material. See floor surface specifications. In some cases it is permissible to lay sheets of aluminum-type sheeting to act as a pathway for the load moving exercise. As long as the base surface is reasonable flat and level this can work fine. Talk to one of our support staff for more info on this method. In some cases it is permissible to lay sheets of aluminum-type sheeting to act as a pathway for the load moving exercise. As long as the base surface is reasonable flat and level this can work fine. Talk to one of our support staff for more info on this method. Leave a comment on What Sort Of Floor Surface Is Required? Very often we find that first time customers prefer to buy their air bearing system in kit form with everything included. This has proved so popular an option that we now quote four and six station kits as standard product items. What does an air bearing kit consist of? Air bearing kits are available in either square aluminum or round steel format. Whichever kit you choose, it will be supplied complete with modules and pre-installed air bearings, valves, air supply hose, tee-pieces, ball valves, and virtually everything else that is needed for your system to work right out of the box. First time setup is a breeze and you’ll be moving loads in no time at all. 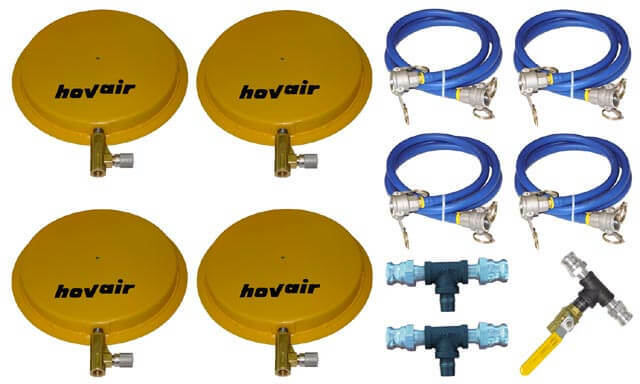 All air bearing kits come complete with easy to understand operator manual, plus you will always have Hovair’s free telephone and email support. Do I have to use all the load modules in the kit? No, not at all. You will need a minimum of three load modules to produce a balanced and even footprint, and if that is enough to move your load smoothly, then you can put the others away for a while.Having, say, a six station air bearing kit, however, does offer greater flexibility when moving loads of uneven weight distribution, or irregular shape. Perhaps you have a load that is 10 tons at one end and only 3 tons at the other. Naturally the ten ton end is going to need more support than the three ton end. So, what to do? Put four modules around the heavy end and two around the light end. Adjust the modules appropriately and move the load smoothly and safely. Now THAT is flexibility! 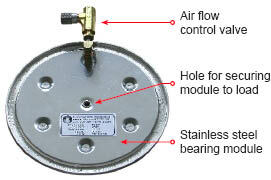 Shown above right is a typical round steel air bearing kit as supplied with all tee-piece and valve hardware, air supply hoses – without a remote control system. 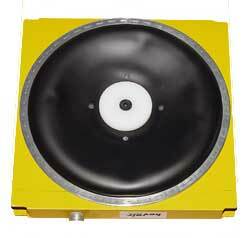 A load moduleor air caster is a machined assembly – either lightweight aluminum or steel – that houses an air bearing. Load modules – also known as air casters – are available for each size of air bearing. Load modules are fitted with inlet ports, or air flow control valves, and contain air chambers that allow air to flow from the inlet to the air bearing to cause pressurization and eventual flotationto take place. Shown to the right is a typical square aluminum air caster module. The yellow part is the actual air caster load module and the black inner section is the air bearing assembly. No problem, you don’t have to. All our air bearing systems are available with or without remote control. Not all applications require their use either. Sometimes it is just a matter of convenience. Shown to the right is a typical round steel air bearing kit as supplied without a remote control system. All of our air bearing and load module systems can be controlled via an optional remote control unit. Remote control units make it very easy to adjust individual air bearings – increase/decrease air pressure – from one central location without the need to go to each module in turn to make adjustments.Remote control units have a main shop compressed air inlet and corresponding air pressure gauge, and individual inlets and air pressure gauges for each load module in your system – usually four or six. Shown to the right is a typical square aluminum air bearing kit supplied with RC remote control unit, hand-held pendant and all necessary air supply hoses. Please note: Remote controls are an optional extra – except on the Low Profile B-type Air Bearing Kit system. Load modules – also known as air casters – are used primarily to house individual air bearings and their load pads to make them ready for operation. An air bearing cannot work on its own. It needs a load module to cause it to receive compressed air, pressurize, and float away from the floor surface. 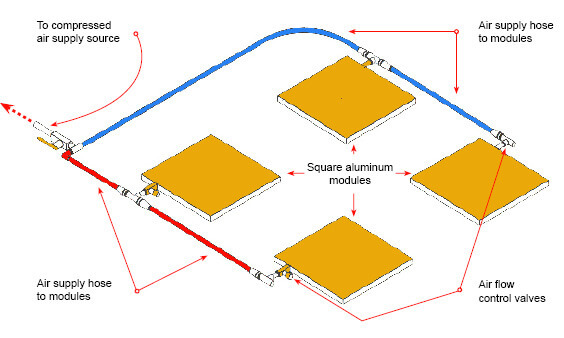 Load modules are used in multiples of three and more and are flexible in that they can usually form a footprint of the load to be moved, and have the load applied directly on the modules and then floated off to their destination. 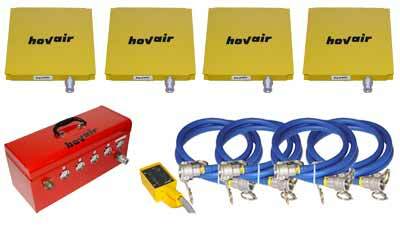 One of the most effective uses of Hovair Systems load modules is in machinery movement. 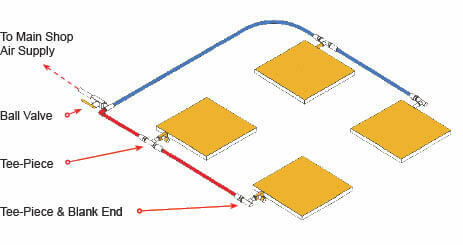 Sliding three or four modules underneath a machine is a breeze. However, some clients prefer to fix the load modules directly to their machines permanently. Then, when the machine needs to be moved, just plug in your shop air, and bingo!… it’s on its way. It really is that simple. Shown to the right is a typical air caster module footprint layout showing a four-module system complete with air supply hose and tee-piece fittings back to the shop air supply. Absolutely. At Hovair Systems we manufacture all our products with the customer in mind. This means that most individual components are easy to locate and replace if necessary. A-type air bearings are fitted to their load modules by a single hex-head bolt through the load pad and into the load module. B-type air bearings are usually mounted on an aluminum back plate which is fitted to the load module via a mounting bolt on each corner. There is also a center fitting bolt through the load pad. VL-type air bearings are not replaceable as they are incorporated directly into their stainless steel modules. In the event that an air bearing needs to be replaced, simply replace the complete module. 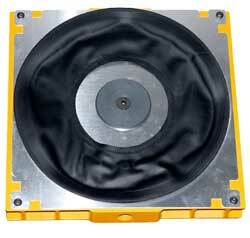 Air bearings are also very easy to replace when they are incorporated into products such as aluminum transporters, air pallets, air beams, lifting jacks and vehicle turntables etc. Every product that leaves our factory has an operator’s manual that covers the air bearing replacement process for that product. On a standard air bearing system using regular A-type air bearings the required minimum air pressure from the shop supply should be 70 psi. On air bearing systems using B-type air bearings the minimum required air pressure from the shop supply should be 70 psi. The volume of air required will differ depending on the floor surface, the weight of the load, and the type of bearing being used. All air requirements will be explained to you at the time of order. Air bearing systems are powered by regular compressed air that runs around most industrial facilities. All of our systems and air other powered products have an air inlet port, or flow control manifold, to connect the shop compressed air supply to. 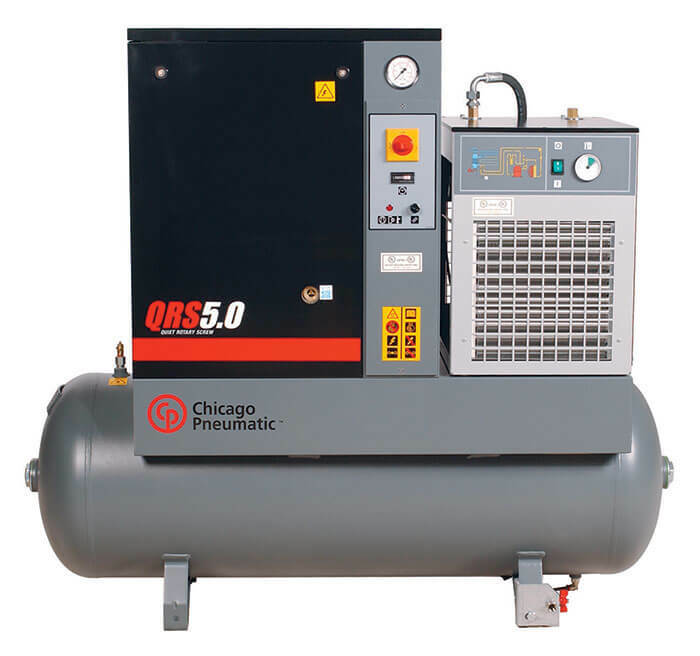 In the case of air bearing systems using, say, a four or six station setup, the shop compressed air supply would connect directly to an air flow control manifold. An on/off ball valve on the manifold then controls the air flow to the air flow control valves on each load module. Individual air bearing control is then applied at the air flow control valves. In the case of air bearing systems that are controlled via remote control, the shop compressed air supply is connected directly to the inlet port of the remote control unit. The remote control unit then controls the air flow to each individual load module and air bearing. Air bearings need to be adjusted for a variety of reasons, some of which we have outlined below: Uneven load weight meaning that certain areas of a load will need more air pressure than other areas. Having the ability to apply more air pressure to individual air bearings means that you can have a more stable, smooth running load moving system. 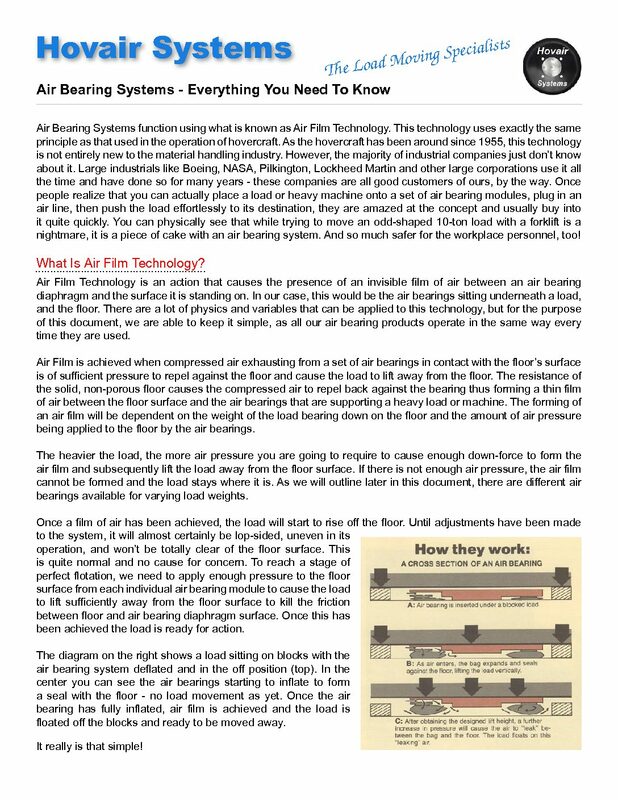 Even the most evenly weighted and level-looking loads may well need to have different air pressures applied to different air bearings. Individual air pressure adjustment will ensure that your loads move smoothly and efficiently across the floor. Loads of uneven or irregular shape can mean that you would need to place individual air bearings at strategic locations with more/less air pressure for balance purposes. Uneven or cracked floor surfaces often cause air bearings to operate less efficiently than when on perfectly smooth floors. You might encounter areas where there are cracks, or small holes, in the floor surface that might only affect one air bearing as the load travels. Being able to adjust/increase air pressure to an individual air bearing will sometimes assist in moving your load smoothly over the deviation. An air bearing is a device, usually made from a rubber-type fabric, that is designed to inflate with compressed air and forms a floating action above the floor surface it is sitting on. 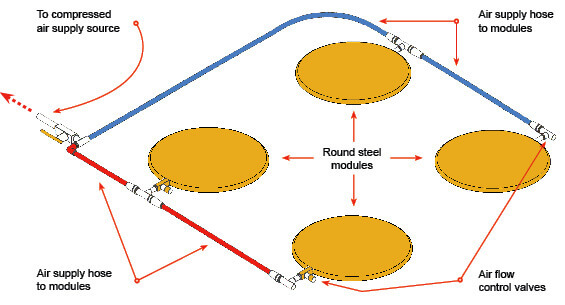 Incorporated into an air caster load module, the air bearing is then used, with others in a series of three or more, to simultaneously float heavy loads away from the floor surface on a thin film of air thus allowing the loads to be floated – similar to a hovercraft – to a new destination. No. Air bearings need to be coupled with other air bearings, in sets of three or more, to form a system that can handle an appropriate load. An individual air bearing is not able to balance a load on its own – it will tip easily – nor is it capable of being adjusted to accommodate variations in load weight and irregular shape. The strength of air bearing lifting power becomes apparent when they are grouped together and their collective lifting abilities are combined to offer some formidable lifting capacities. When air bearings are grouped together to form an air bearing system, they then offer some real lifting power. The beauty of using air bearings in groups of three or more is that they can be individually adjusted to suit the properties of the load they are carrying. 1.If the air bearing is part of a manually operated system, (no remote control unit) then each load module will contain an air flow control valve on one of its edges. This air flow control valve can be used to control an individual air bearing by increasing or decreasing the amount of air being applied to the bearing. 2.If the air bearing is being used as part of a remote controlled system, the load module will have an air inlet port on one of its edges. This port accepts an air supply hose, fitted with quick disconnects, which runs to an air outlet port from the remote control unit. Air flow control to the bearing is controlled from the remote control unit.